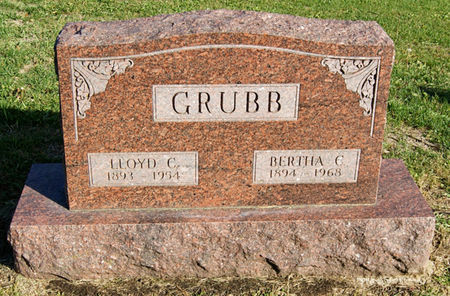 Lloyd Chester Grubb, son of William Larkin Grubb and Samantha Watkins, was born Aug. 21, 1893 near Conway, Taylor Co., Iowa and died Oct. 22, 1954 north of Bedford, Taylor Co., Iowa. He married Bertha Clarice Jarvis Jan. 30, 1918 at Conway, Taylor Co., Iowa. She was born Dec. 14, 1894 near Platteville, Taylor Co., Iowa, daughter of Elmer Jarvis and Minnie May Hogue, and died July 31, 1968 in Corning, Adams Co., Iowa. Searching for BERTHA CLARICE GRUBB in Taylor County Iowa?